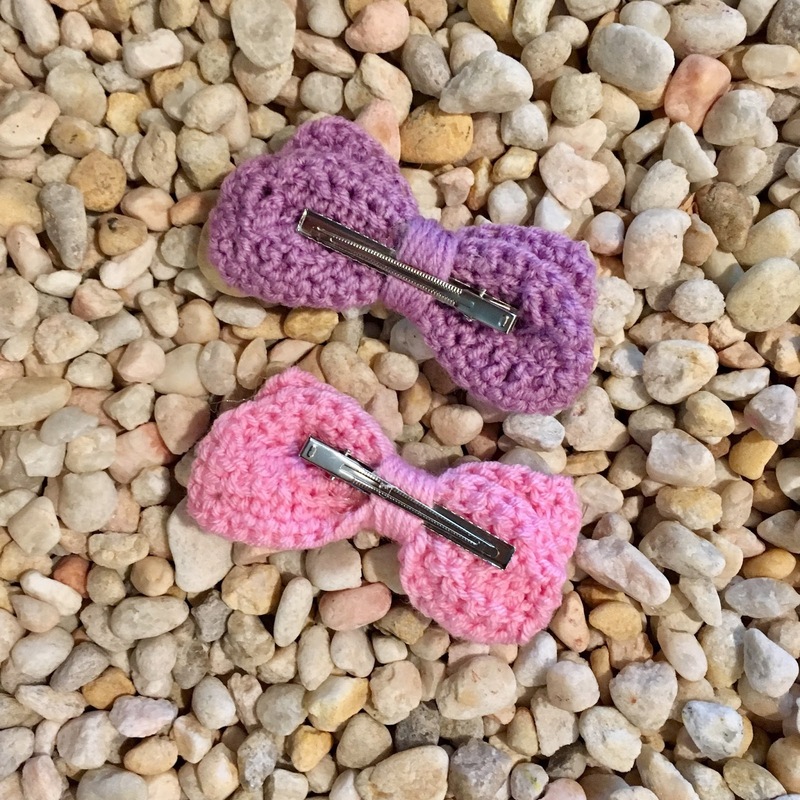 These little girls love bows! 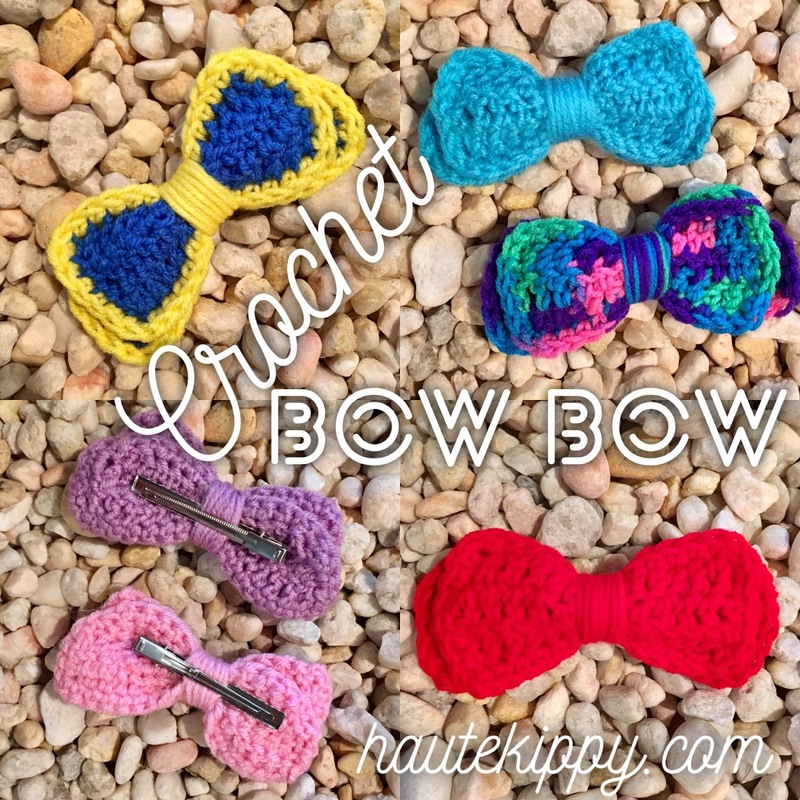 Big bows, small bows, sparkly bows.... crocheted bows? Yes. We are all about bows in my house. 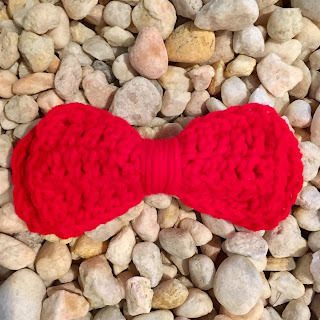 My little one will wear a bow every day and my big girl loves to wear big bows to school with a ponytail. I don't know about you but I'm not particularly good at working with ribbon, and tying bows. Also, wide grosgrain ribbon can be pretty pricey! But you and I know how to crochet, right? And we've also got tons of yarn, don't we? It's OK I won't tell anyone how big your stash is! 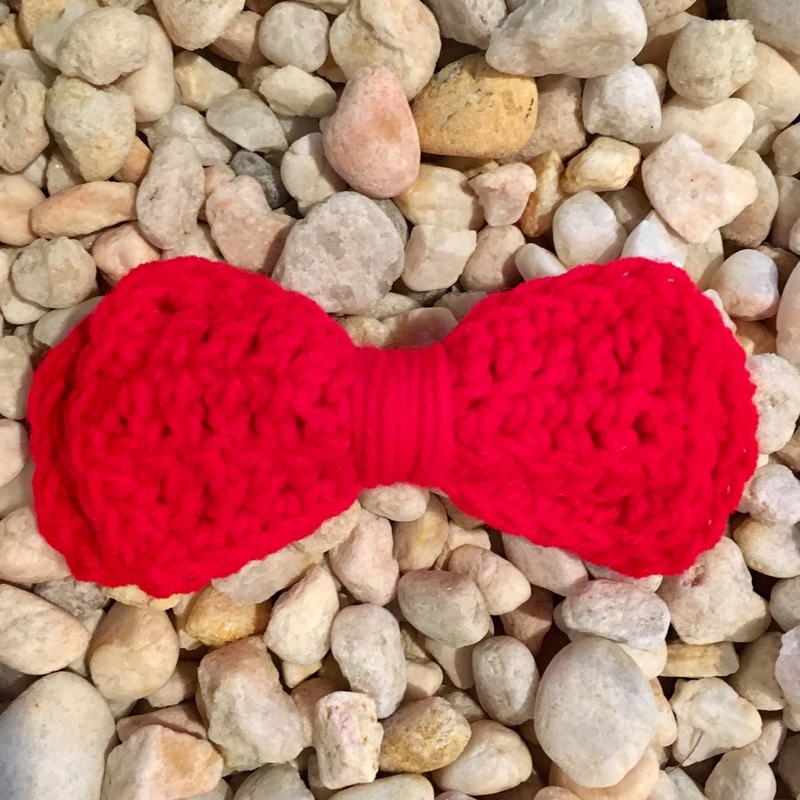 So lets make our own trendy hair bow in any color we want! A Bow Bow in Big Girl's school colors! I'm using a selection of Red Heart Super Saver worsted weight yarns, as well as some small balls of scrap yarn I had laying around. These pretty bows are the perfect stash buster! I developed this project as an adaptation of my applique bow pattern. If you like appliques and how cute they look when you sew them on to a project, you can find more free patterns at allfreecrochet.com, the ultimate source for free patterns in a multitude of projects! 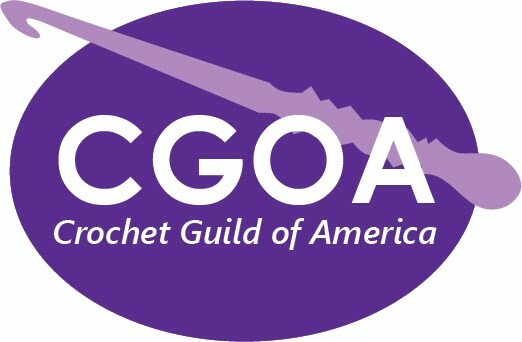 See hundreds of free crocheted applique patterns there. 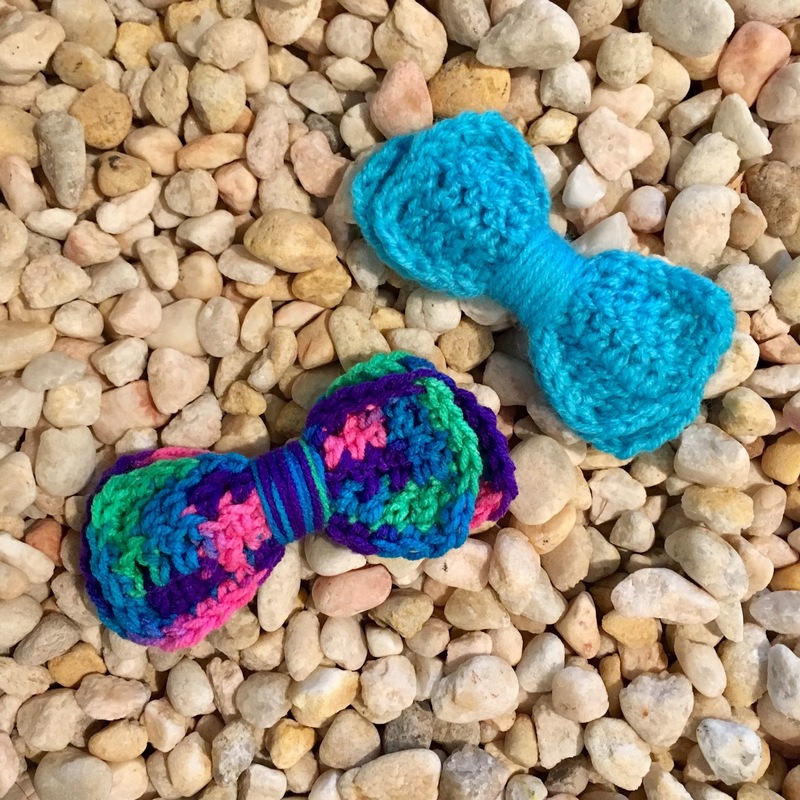 Try a Bow Bow in variegated yarn! 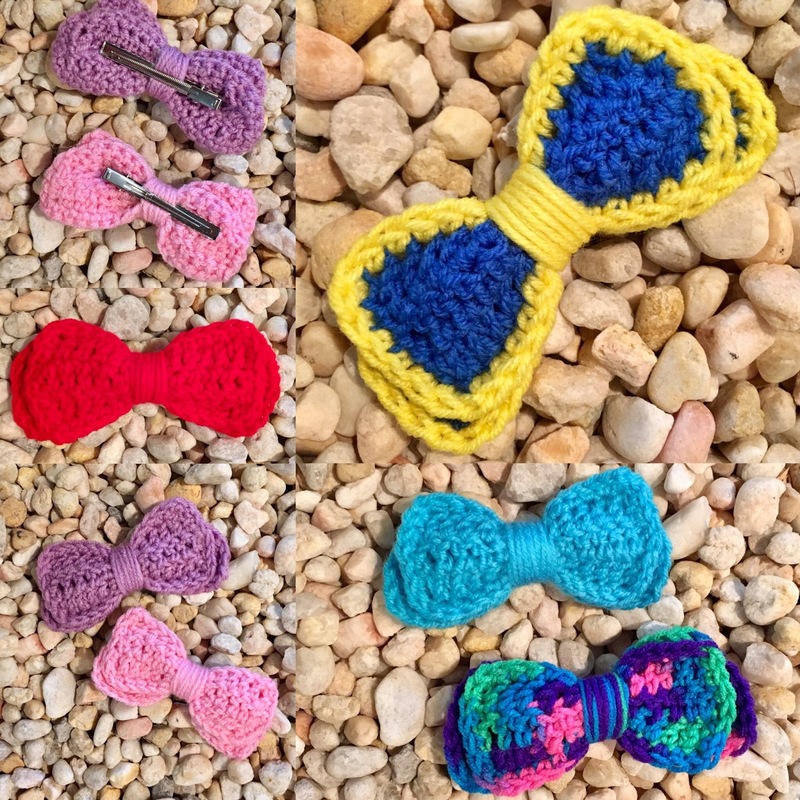 To make this crocheted Bow Bow Barrette you will need to purchase alligator hair clips. I purchased these alligator clips from Amazon. They are nice and large 3" in length, just perfect for this project and many others. 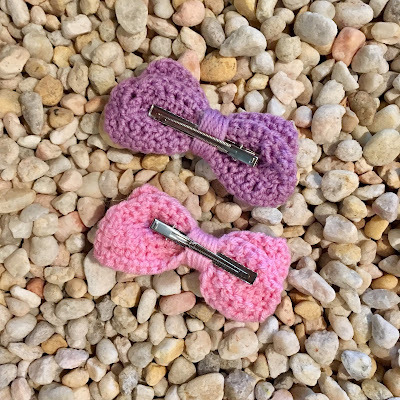 They're a good value and are exactly the same style clip that comes on large fancy store-bought ribbon bows. 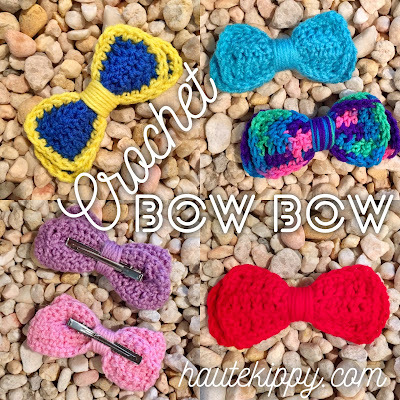 You'll also need a hot glue gun, yarn needle and any worsted weight yarn. Here's a great glue gun, perfect for this project. With so many other household uses, if you don't already have a glue gun, now is the time. You can purchase a clean PDF download of this pattern to own, print, and take on the go! Click the button to get your Ravelry download. Thank you for supporting more free content! Row 3: dc in first four sts, hdc, sc, sc, hdc, dc in last four sts, then ch 1, pivot bow to work along raw edge, sc evenly across making 2 sc in the end of each dc across (i.e. 6 sc along raw edge), ch 1, pivot work, sc in each st across, ch 1, pivot work, sc evenly across raw edge as before, ch 1, pivot work, sc in each st across, ch 1, join at corner. (Invisible join looks best) FO, weave in ends. Row 1: dc in third ch from hook, dc in next four chs, hdc, hdc, sc, sc, hdc, hdc, dc in last five chs, ch 2, turn. Row 2: dc2tog, dc in next three sts, hdc, hdc, sc, sc, hdc, hdc, dc in next three sts, ch 1, dc2tog, ch 2, turn. Row 3: dc2tog, dc in next two sts, hdc, hdc, sc, sc, hdc, hdc, dc in next two sts, dc2tog, then ch 1, pivot to work along raw edge, sc evenly across making 6 sc along raw edge, ch 1, pivot work, sc in each st across, ch 1, pivot, sc evenly across raw edge as before, ch 1, pivot, sc in each st across, ch 1, join at corner. (invisible join looks best) FO weave in ends. Layer bow on top of bow tail, keeping right sides facing up. 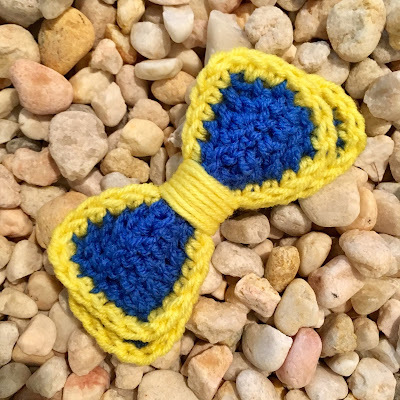 Thread yarn needle with a length of yarn and wrap yarn around center of bow, when wrapped, sew back and forth on wrong side of bow to secure yarn tail. Insert alligator clip through wrapping, and hot glue underneath to permanently secure. You may sell items made from this pattern, but you must credit Haute Kippy with the original design and provide my website for reference. You may not use my photographs to sell your items. Do not copy, distribute or repost this pattern in part or in whole, do not alter or redistribute this original work as your own. 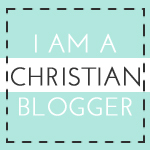 If you wish to share, you may link to my website only. Copying with intent to share is a form of theft and is a copyright infringement.